Q. What does Alconox recommend for removing DNA from laboratory equipment? A. 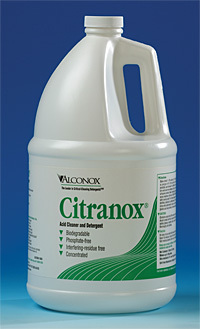 Since DNA is stable to alkaline hydrolysis, we recommend testing 1% Citranox Liquid Acid cleaner, pH 2.5 for removing DNA. Acids at high temperatures are capable of breaking the DNA molecule into its components. Note the working concentration Citranox recommended here is a starting point, higher concentrations may be required to achieve desired results. At Alconox we understand how important it is to have clean laboratory equipment, and recognize that any “leftover” DNA (or protein or RNA) could potentially contaminate your next experiment, we suggest that you analytically test for removal of these substances. If you require MSDSs and Technical Bulletins, please download them from www.alconox.com. To request free detergent samples please complete the Get Sample form. To ask our experts another cleaning challenge please visit Ask Alconox.